For someone who’s on probation for 8 misdemeanors for online harassment and stalking, you’d never know it by Steve Markle’s behavior. But is Steve alone in his online adventures? 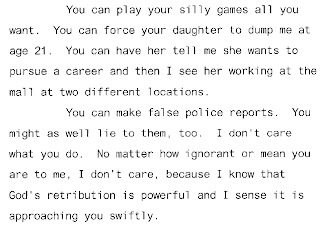 In December of 2005, Steve’s wife Cheryl, according to trial transcripts, listened to how her husband pretended to be law enforcement, ‘spoofed’ email and host of other tricks that targeted Steve’s ex-girlfriend’s kid BROTHER! Steve was found guilty by 12 people of harassing and stalking the brother of a girl who dumped him 10 years prior! Cheryl is well aware of why her husband was convicted and sentenced to six years of probation. 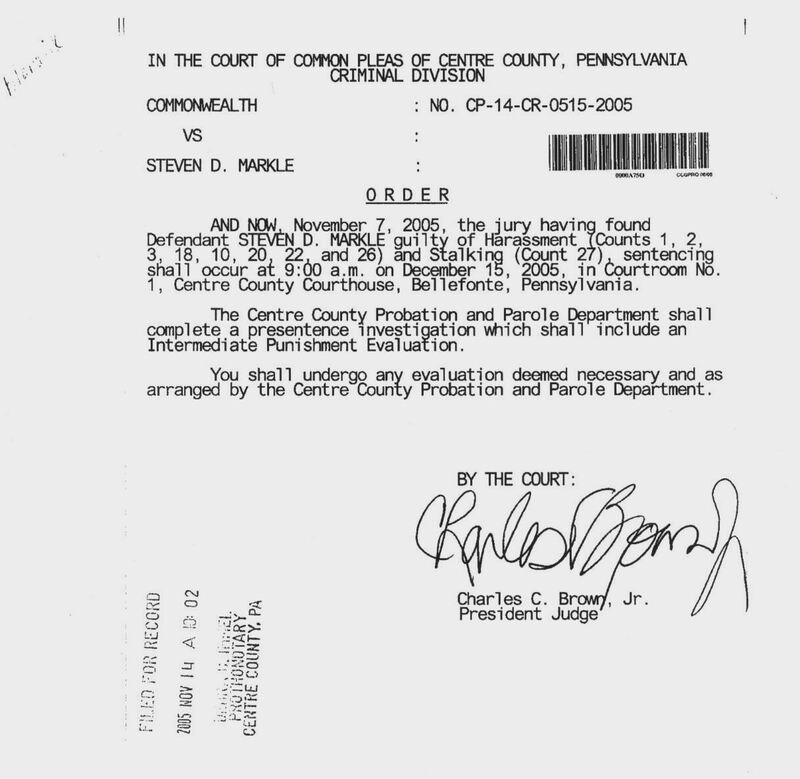 But that’s not all, in April of 2007, Cheryl and Steve had Lancaster County District Attorney detectives raid their Leola, PA home after two email account were hacked into by a computer using the Comcast IP address registered in Cheryl’s name. According to the Search Warrant Application as pictured in the redacted copy below, Detectives took all of the Markle’s computers while Steve and Cheryl watched. In May, the email associated with StalkerWarning.Blogspot.com (and the website itself) was hacked into by a Comcast Address associated with other Markle comments sent to this blog. It seems Markle is up to his same tricks. By this time, Cheryl is well aware of what her husband is up to. The only reason law enforcement didn’t bring charges last time was because they were uncertain if Cheryl did it because the internet connection was in her name. Cheryl can no longer claim innocence. For Steve Markle, his conviction of 8 Misdemeanors is all wrong. He sees nothing wrong in his behavior. 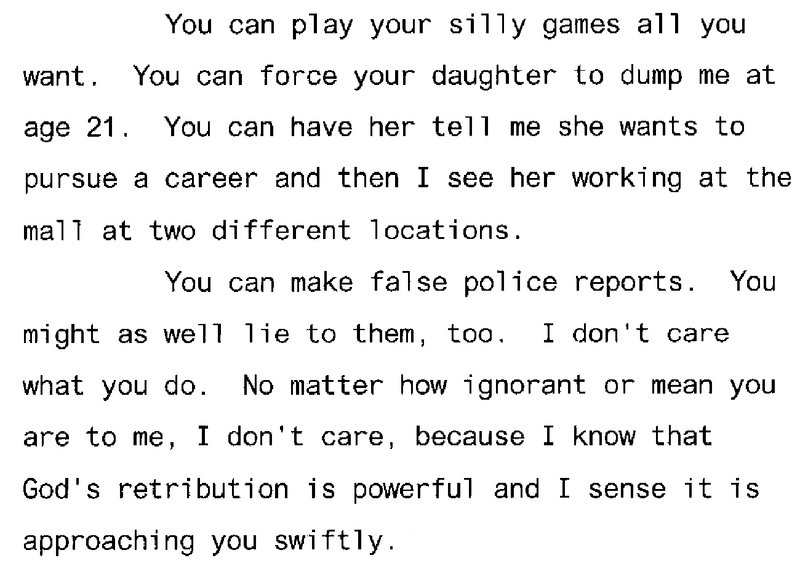 Notice Markle believes that because this cop has some incident with his son, that it means Markle must be innocent of the charges brought by the cop. Markle can just erase the fact that 12 people in a jury heard how he harassed and stalked a boy and they declared that he was GUILTY. And what about the District Attorney (DA) in Centre County? After Markle was charged with over 2 dozen crimes, the DA went missing – never to be found again. Markle believes that because the DA was missing that his prosecution is not valid! Then there is Markle’s continued posting of his ex-girlfriend’s family on the internet despite his current probation for harassing and stalking the boy. Markle can’t control himself. And if anyone else that has as much as a traffic ticket? To Markle, that person is a convict/felon! Markle’s jury Misdemeanors mean nothing to him but everyone else’s relatively minor issues are major league big -deal! In the mid 90’s Steve Markle was dating a girl for about three years. She dumped him. Let’s just say that Markle didn’t take it to well! To this very moment – nearly 15 years later – Markle insists that his ex-girlfriend owes him an apology! Can you imagine the poor girl who is currently married to Markle that had to see her husband get convicted of 8 counts of online Harassment and 1 count of stalking – 10 years after her husband gets dumped by an ex-girlfriend?! But get this – Markle was CONVICTED and is currently on PROBATION with the Lancaster County Adult Probation for crimes against his ex-girlfriend’s, little brother! Besides these 9 conviction, Markle’s history includes another harassment charge and several Protection From Abuse orders against him. You know where/why Markle calls himself The Crow? It’s a story about a guy that gets murdered with his finance on Halloween Eve and get resurrected to enact REVENGE! 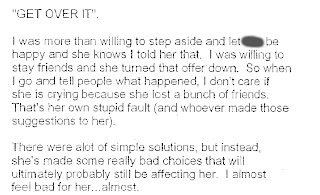 Remember that Markle blames others for getting DUMPED by his girlfriend! And he got CONVICTED for ‘getting’ her brother and continues to ‘get’ her dad for supposedly causing his ex to DUMP Markle! YIKES! Markle’s blog is located @ smartretorts.blogspot.com – do not go there! He places graphic within the website that will indicated your IP address. He’ll then use that to try and located you! If you ever seen an email from Eric Draven or anything related to ‘The crow’, make certain you have your graphics turned off in your email program. This is how he’ll verify that it was YOU that visited his blog. To give you an idea of how twisted he is – he has several rants on his blog about people that he can’t figure out and wanting to know WHY they were reading his blog!! Why have a blog and then lament when people come to read it?!? 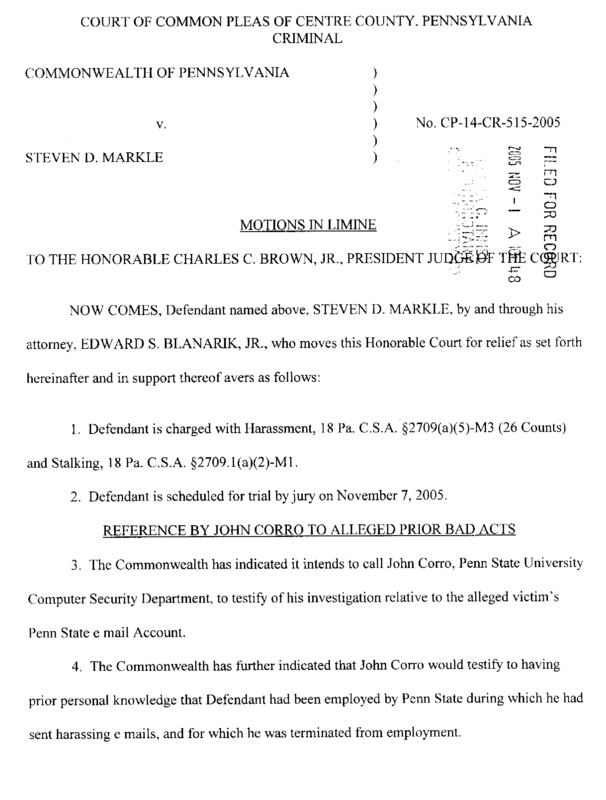 The following is ‘Exhibit #29 from Commonwealth of Pennsylvania v Steven D Markle. It’s part of the evidence used to convict Markle for 8 counts of harassment and one count of stalking. Notice that he taunts in the subject that Markle is ‘Too good huh?’ Too good to get caught. 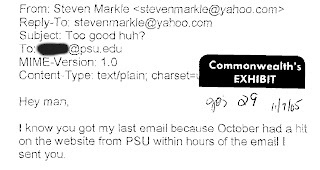 Amazingly, as smart as Markle is, he puts, in an email to his stalking victim, that he is using implanted images to ensure that his harassing emails are reaching his target! Keep in mind that his trial for harassment and stalking is TEN YEARS after Markle was dumped. 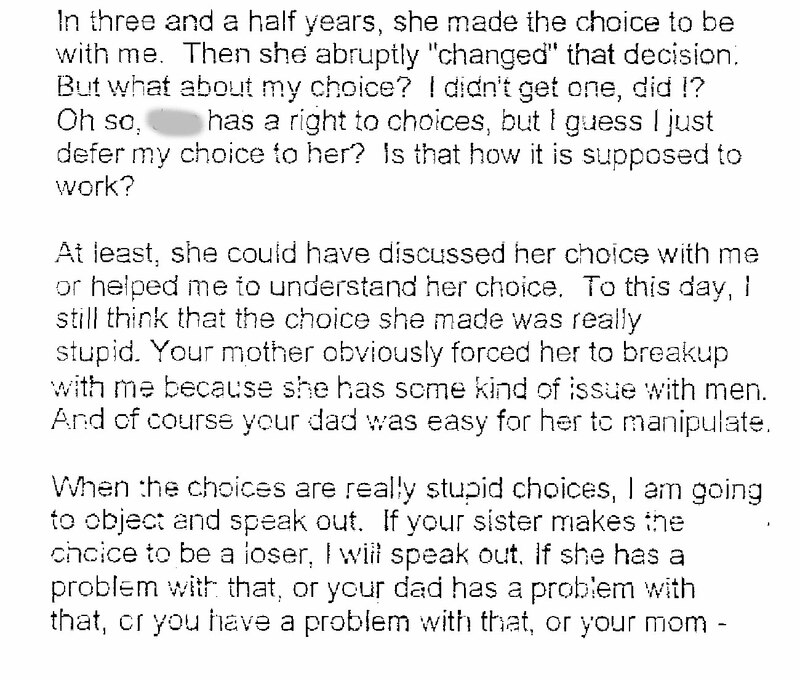 This was an email to his ex-girlfriend’s BROTHER who was 13 years old at the time! Markle wants to go into detail with her kid brother about what happened to cause their breakup! Markle rhetorically asks the question about people making choices “Is that how it is suppose to work?” Markle does NOT get that people can make a unilaterally decision! 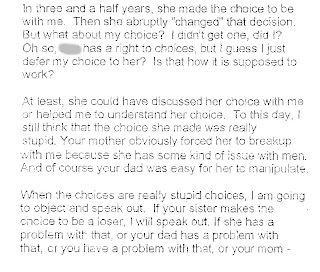 While Markle says the girl is allowed to make choices, he goes on to whine about her not ‘discussing’ it with him and how that cuts him out of control! 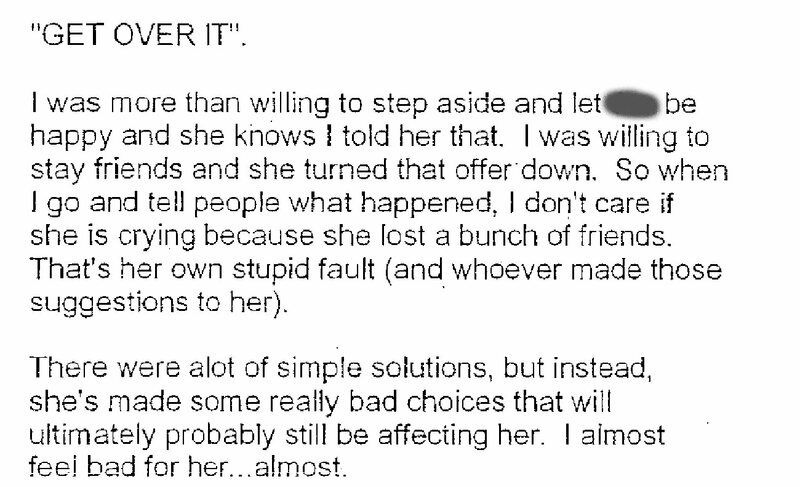 Notice that according to Markle, the girl didn’t dump him on her own! Oh no. It had to be the mom and dad. There’s no way the girl would dump Markle on her own. And because she dumped him? SHE is the ‘loser’! Now how is that for clear thinking? The next thing Markle says would be really funny were it not for his twisted projection of his own problem. “GET OVER IT!” Markle tells the little bro of his ex-girlfriend. It’s now 15 years later and Markle STILL can’t get over the fact that this girl dumped him! Notice that Markle was ‘willing to step aside’ and ‘willing to stay friends’. Isn’t that sweet? And now the threats. Markle was ‘willing’ to be ‘friends’ and Markle says that he has been ‘extremely ‘lenient’! Isn’t that nice that according to Markle, he’s let them off the hook? Yikes! Markle ‘accidentally’ broke the storm glass window with his FIST! What about the future? Markle say that the next time, “wouldn’t be so lucky”! In another email regarding his ex-girlfriend’s dad, Markle reveals that he KNOWS where she was working “at two different locations”! Keep in mind that Markle has previously had Protection from Abuse order slapped on him by this girl and he’s still keeping tabs on her? Keep in mind that Markle is MARRIED to another woman ALL the while, he is lamenting this girl that dumped him years earlier! Markle is on probation until July of 2012. Despite his conviction of online harassment and stalking and continued tracking, harassing and stalking, the authority’s seem to be ignoring Markle’s illegal behavior. Please call them and let them know if you are his victim. Markle’s website is located at smartretorts.blogspot.com It’s not uncommon for Markle to collect user’s IP address and then TRY and figure out who they are. We suggest you stay away! FIRED! 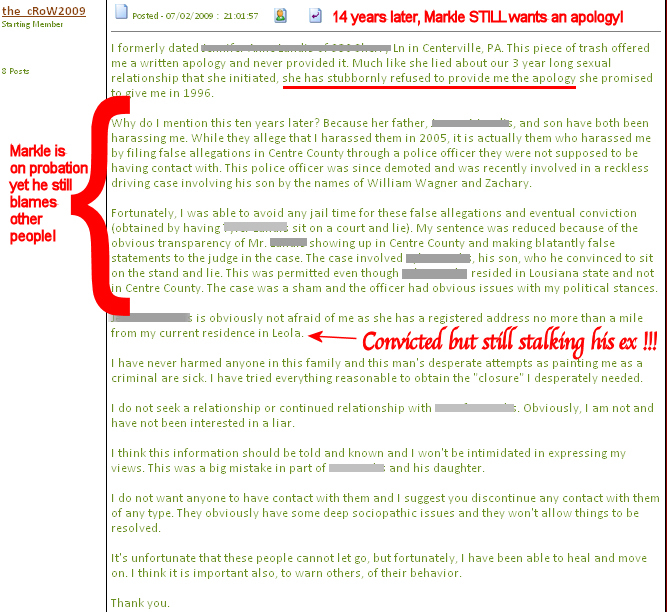 Markle has been fired before for harassing email! Here’s Markle’s attorney trying to get Markle’s former boss silenced! 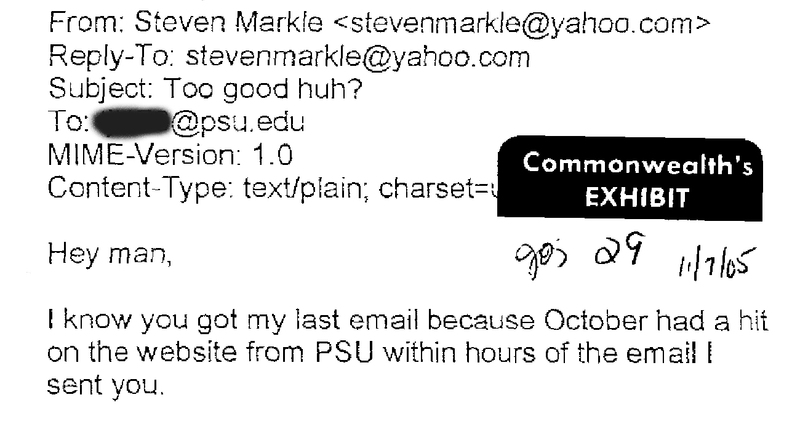 It seems that Markle use to work for the IT department at PSU and was canned because he sent harassing emails. Years later? Markle’s old boss is testifying against him – helping to get him convicted of harassment and stalking.! A common theme in Markle’s harassment and stalking is his irrational hatred. Take his blog, smartretorts.blogspot.com Markle is so blinded by his hate for Gil Smart (who CREATIVELY uses Smart Remarks) that Markle named his blog using Smart’s name. We suggest you do not go there! Markle was dumped 15 years ago May 2010. Until this moment, he’s STILL obsessing over being dumped. His blog, smartretorts.blogspot.com is laced with his obsessing over other people he’s alternatively jealous/angry at for various reason. 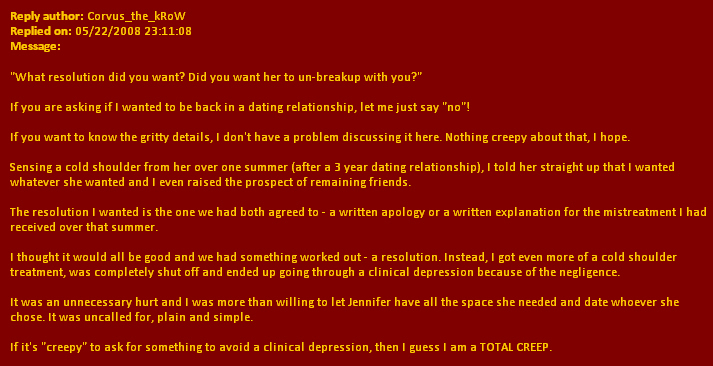 Even though Steve Markle, aka the crow, is on probation for harassment and stalking, he appears undeterred in going after various private people for no reason other than he wants to! In public posts as ‘the crow’ and on his blog smartretorts.blogspot.com (do not go there!) Markle attacks various people.